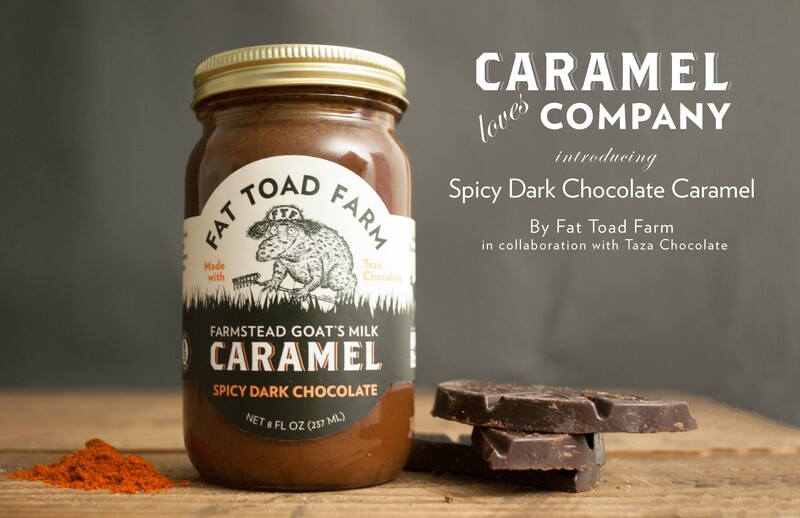 Spicy Dark Chocolate Caramel– a delectable partnership with Taza Chocolate! 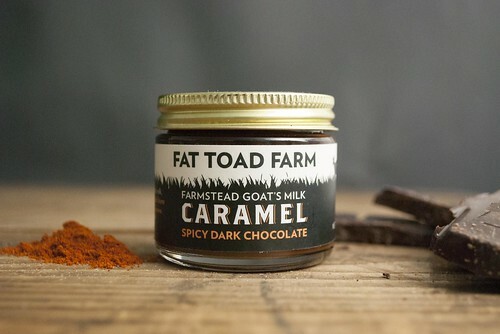 This decadent newcomer is the perfect combination of our not-too-sweet goat’s milk caramel sauce, Taza Chocolate’s organic, stone ground chocolate and a kick of ground cayenne. Using milk from our own herd of goats, we make a goat’s milk caramel sauce, which is hand-stirred to velvety perfection in traditional copper kettles. Taza Chocolate, relying on the natural complexity of cacao by stone grinding cacao beans, creates a chocolate that is minimally processed, boldly flavored and perfectly delicious. 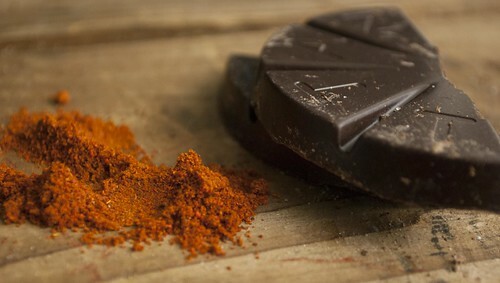 Our Spicy Dark Chocolate Caramel comes together by slowly stirring stone ground chocolate and a healthy pinch of cayenne right into the almost finished caramel. Once the chocolate has fully melted, the caramel is dark, rich and beautifully freckled. Our Spicy Dark Chocolate Caramel will capture the attention of your taste buds with its rich, complex chocolate start, then will lure you in further as you start to taste the subtle sweet tang of the goat’s milk and just as you think the experience is over, BAM! a little kick of cayenne pepper will leave you wondering where this caramel has been all of your life. This newcomer is ready to spice up your everyday snack; so sit down with your favorite ice cream and add a healthy drizzle, get out a big bag of pretzels and get ready to dip or see if you can stand the heat and eat it by the spoonful. Regardless of how you enjoy it, your relationship with caramel will never be the same! In a small saucepan over medium heat, combine water, sugar, salt, and butter. Bring to a boil and remove from heat. Immediately stir in flour and mix until it forms a ball. Heat oil for frying in deep-fryer or deep skillet to 375 degrees F. Pipe strips of dough four inches long into hot oil using pastry bag. Fry until golden (about 10 minutes, constantly flipping); drain on paper towels. Combine 1/2 cup sugar and cinnamon. Roll drained churros in cinnamon sugar mixture. 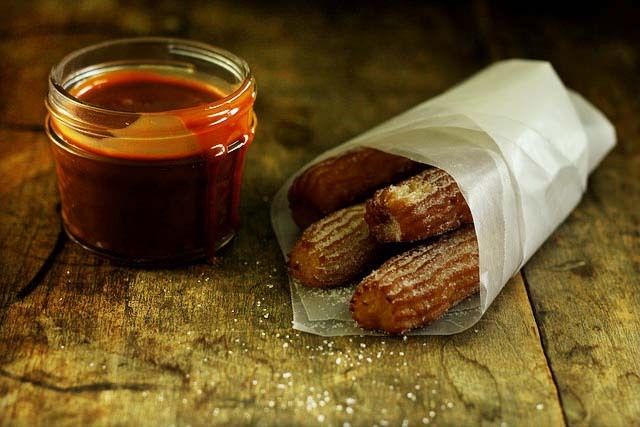 Warm the caramel over medium heat in a small sauce pan and serve with the churros.